With a festive party wreath on the front door you will know you have arrived at the party. Why not start your decoration at the front door? 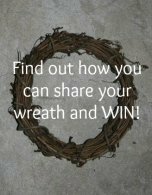 Just like a Holiday Wreath it gets people in the mood the minute they arrive and sets the spirit. gift for the guest of honor. Baby Shower wreaths make great decorations and a gift for the mother to use in the nursery. Diaper wreaths are so beautiful and are designed to be taken apart and the items used for the baby to be. 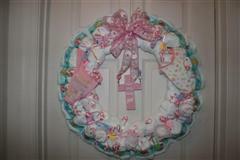 Diaper wreaths are not hard to make and can be customized to many different themes or colors. I made this diaper wreath and donated it to our church baby shower for Sharing and Caring, an organization that helps mothers in need. I thought it was pretty and practical and it felt good to give to someone who might need to be lifted by something pretty to hang in her nursery. A bridal shower wreath can also double as a gift for the new bride to be, made in her wedding colors or colors she will be decorating her new home with. This will make a nice gift and be a beautiful reminder of her shower and a new addition for her new home. Birthday wreaths are fun and easy to make. They can be simple like the one I made one afternoon for a birthday dinner or they can be a spectacular design for that 21st or 50th milestone birthday. Monogram for that special anniversary. Heart shape for the bride to be. Names and numbers for that special birthday. Sweet 16! Picture frame added to wreath of special event. All sure to be party starters. If you have a special event coming up don’t forget your front door decoration.